This is my son's favorite story. He reads it to us every year on Christmas Eve and was thrilled to have this beautiful heirloom edition. The book is truly a work of art. Stunning graphics accompany a story we all know and love. The large coffee table or lap book will be a favorite for years to come AND it comes with an envlope that contains 2 CDs. 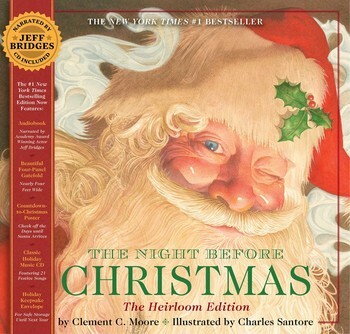 One is the book audio featuring Jeff Bridges reading the story so you can read along and the other contains holiday music to be played during your festivities or as background music as you read this Family Favorite. Included in this year's Maria's Space Holiday Gift Guide. Disclaimer: I received a complimentary product for my honest opinion. My star ratings are exact based on Amazon's star descriptions. My reviews are 100% honest and true based on my personal opinion not on a company’s description or request. I am not employed by any company I review for. No monetary compensation was received. This would be a great edition to have for my grandchildren.